Warner Bros. Television Entertainment © 2012 WBEI. All rights reserved. To watch Mayim Bialik accept a tiara is to watch a wallflower blossom. As she segues from the words “transparently manipulative,” to the sing-song, “Ooooh, it’s a tee-ah-rah,” when she sees the gift, you cannot help but laugh. 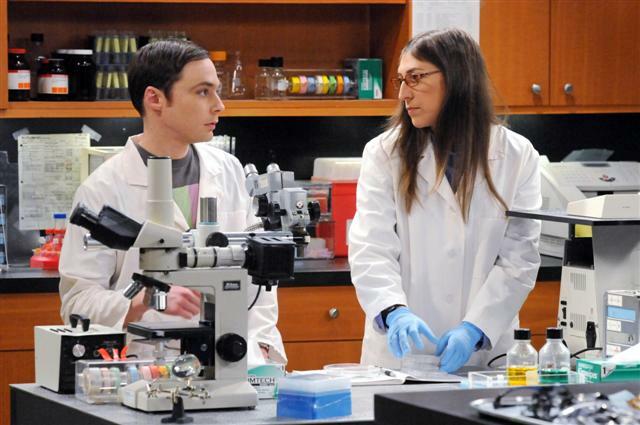 Her knees go weak, her voice gets loopy and her character, the frumpy, geeky neurobiologist Amy Farrah Fowler on CBS’ hit series “The Big Bang Theory, displays her inner princess. It’s priceless. 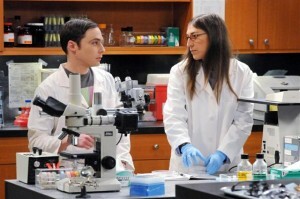 And it’s part of what has pushed the “The Big Bang Theory,” now in its fifth season, into being one of television’s top-rated shows. Not bad for an ensemble vehicle about the work and love lives of a bunch of socially challenged scientists at Caltech. Does her Jewish journey ever collide with the rest of her life, in some kind of cosmic bang? “For me, only in good ways,” says Bialik, who has a Ph.D. in neuroscience from UCLA. “I was taught very early on in my college and academic Jewish education that the Torah is not a science book and not a history book.” As for the science? “It only emphasizes my appreciation of something divine,” says Bialik. parenting, Judaism and combining it all with a show business career. At 6 p.m. those women can attend a private meet-and-greet with Bialik for $180 at Town and Country, 922 9W, Congers. The festivities continue at 7 p.m. when $65 will get you a seat to hear Bialik speak. Want to bring along your teen or college-age daughter? That will be $50. There will be an auction, signature cocktails and kosher dairy hors d’oeuvres. “We thought this would be a fun thing to get the message out of letting people know what Federation does,” says Federation board member Bonnie Werk, who is co-chairing the event with Kristen Stavisky. The event’s main sponsors are Good Samaritan Hospital’s Breast Center and TD Bank, with Active International also sponsoring. Bialik enjoys speaking to Jewish groups. It gives her a chance to talk about her Jewish awakening, which began when she started studying at the UCLA Hillel as an undergraduate. “I was very attracted to the intellectual and halachic aspects of Judaism,” says Bialik, who describes herself as “aspiring Modern Orthodox.” “I kept studying and learning and find that observing Torah living helps me best become the person I want to be. But how does that work with two small children and a career in a major television series? Bialik only wears skirts, even on the television show. She keeps an eye toward looking good, modestly, for red carpet appearances and has so far managed to successfully navigate the romantic encounters between Amy and Sheldon, played by her co-star Jim Parsons. “I’m glad I’m not working in feature films, where the sexual boundaries . . . ,” she trails off. Bialik hails from a family that was steeped in Yiddishkeit. Her grandparents were Orthodox, an aunt had made aliyah, and observance was all around her. She just didn’t live that lifestyle. Though clearly, with a name like Mayim — Hebrew for water — Jewishness was never far from her family’s heart. Blossom then, like “Big Bang’s” Amy now, allowed her to play a multi-faceted female, which is what lets Bialik work her acting chops. With her current character, Amy, Bialik loves that “anything can come out of her mouth. What comes out of Bialik’s mouth, though, is highly considered and frequently funny. While she’s clearly not her character – her social skills are way too adept – her brainy-ness does shine through. But then what would you expect for a woman who studied obsessive-compulsive disorder in adolescents with Prader-Willi syndrome. While working with children with very special needs, she found that studies of the syndrome tended to focus on either the genetic component or the psychological one. None had ever looked at Prader-Willi, a genetic disorder characterized by morbid obesity, through neuroscience. The quality, of always seeking an answer is a great strength of Bialik’s, according to Aviva Kohl, a good friend of the actress who leads JCC Rockland’s tot Shabbat and a Torah study class for the Deborah Koenig Parenting Center. “She is a truth seeker, she really wanted to understand and asked questions until she got it,” says Kohl, who met Bialik when Kohl and her husband were living in California, working at the Valley Jewish Learning Center. Bialik came right before she got married to study for several months and over time the two became very close friends. And anyone who has seen Bialik promoting her new book, “Beyond the Sling,” has gotten an idea of what she can throw herself into. Promoting attachment parenting, she combines her own parenting approach and insights, backing them often with medical and psychological research without “medicalizing” the very act of being a parent, she says. A self-described vegan, Bialik promotes following your own intuition when it comes to being a mom. In her case, it meant taking time off to be with her young children 24/7. She and her husband eschew babysitters, and when she spoke for the Jewish Federation of Orange County two years ago, he and her two sons traipsed along as an entourage. Rather than stay at a hotel, they slept as a family on mattresses on the floor at Mona Rieger’s house in Newburgh. For Bialik, who also teaches science in a home schooling community, the parenting and green living all simply make sense. In some ways, they stem from her Jewish background, she says, consistent with her upbringing, her values and her continued learning.